Numerous individuals habitually presuppose that frequent employment of increasingly complex language induces a perception of superior intellect. As you might be glad to know after struggling through that sentence, it’s not true. Despite the hopes of generations of essay-writing students, using big words doesn’t make us look smarter. In fact, studies show that the reverse is true. Daniel Oppenheimer did a set of experiments in which he gave people various writing samples to read and asked them to rate the intelligence of the writer. Writers who used simpler language were consistently rated as more intelligent than writers who said exactly the same thing using longer words, whether or not the readers were told the names of the authors. Oppenheimer theorized that the reason was due to the “fluency effect”: the easier we find it to acquire information, the more positively we rate that information. He tested his theory by asking another group of readers to rate the intelligence of writers, but this time gave them all the same text but printed in different fonts. Again, the writers whose work was easier to read were judged to be more intelligent, even though the readers were led to believe that the font choice came from the researcher. Hard-to-read fonts also make us think the content of a piece of writing is more difficult to act upon. 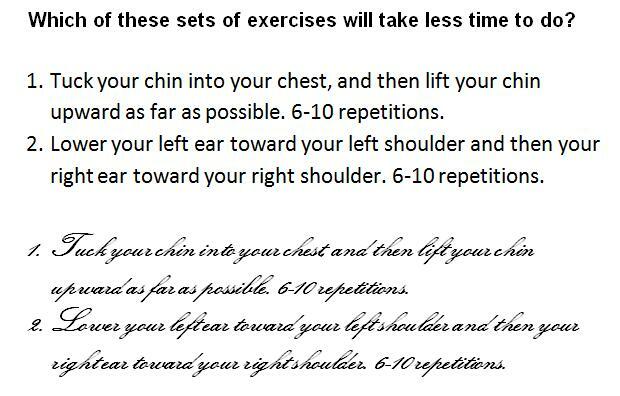 Hyunjin Song and Norbert Schwarz presented their study participants with either of two printed versions of a simple exercise routine, much like the ones in the picture. Those who read it in an easy-to-read font thought it would take 8.2 minutes to complete, but those who read the same instructions in a difficult-to-read font thought it would take 15.1 minutes – nearly twice as long. The readers who saw the easy font also said they’d be more likely to incorporate the exercises into their own routines. Another study found that people presented with a choice of two options were much more likely to put off making a choice if the information was presented in a fuzzy, difficult-to-read font – but not if the difficulty of reading the font was acknowledged in the study instructions. Apparently, the study participants interpreted their difficulty in reading the information as difficulty in making the choice, but once the actual obstacle was pointed out, the effect went away. It applies to credibility, as well. In one study, statements that were presented in highly visible (contrasting) colours were perceived to be true significantly more often than the same statements presented in less visible colours. So, if you want people to read your writing, believe your statements and act on your suggestions, make them as visually clear as possible (unless you’re writing for academia). If for some reason your information must be presented in a less-clear way, make sure you point that out to your readers so that they won’t blame the information itself for their reluctance to read it or act on it. If you want to be perceived as intelligent (and I can’t imagine why you wouldn’t), go for clarity in your prose as well as your printing. And if you wrote the instruction manual for my cell phone, I am very definitely talking to you.